This is the Mugen Driveshaft Pin Replacement Tool. 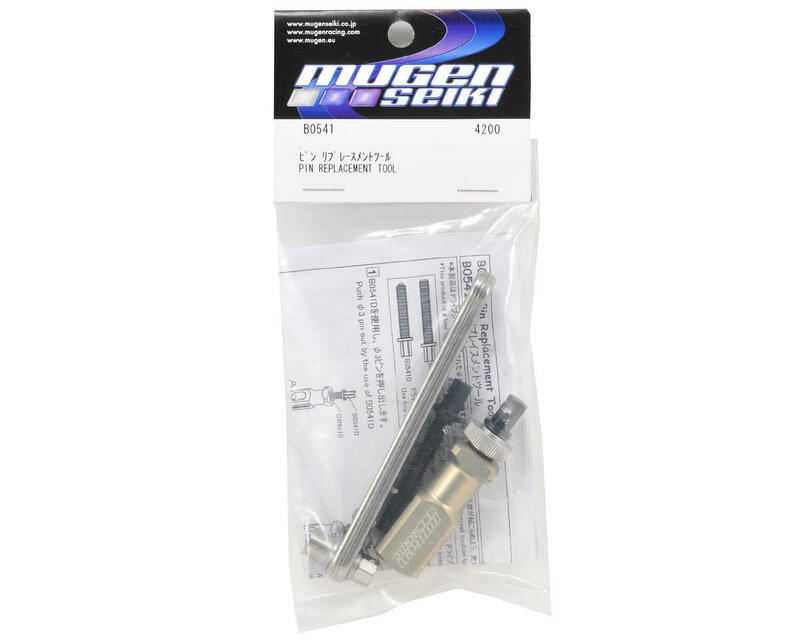 This must have tool will press in and remove any 3mm pins from the head of the drive shafts on all Mugen MBX5, MBX6 and MBX7 vehicles. Now instead of replacing the expensive drive shaft a simple replacement of the pin is quickly done with this Pin Replacement Tool. 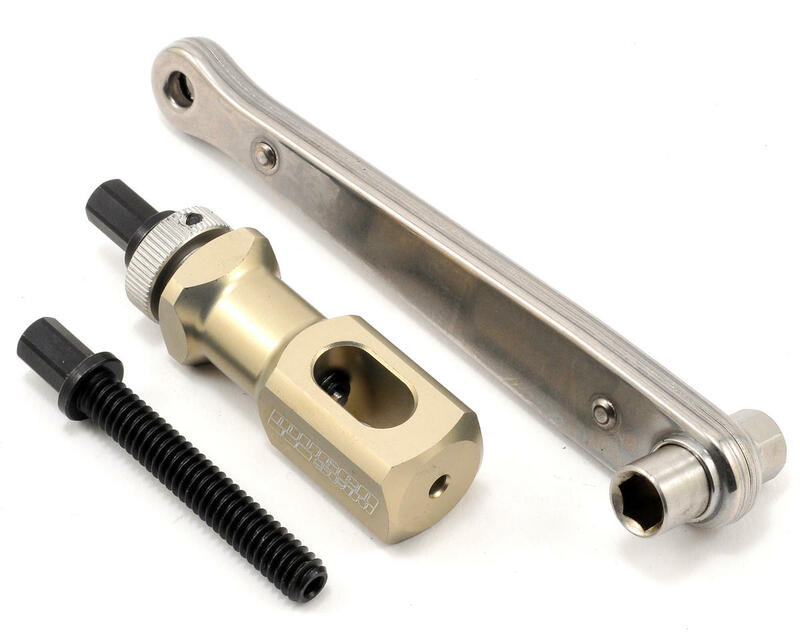 By using the appropriate length pin, and the Driveshaft Pin Replacement Tool, you can dramatically extend the useful life of your drivetrain parts. This is a great product that will help prolong driveshaft life and save money in the long run. Don't listen to the people who say the pins break; if you use the tool properly it will not. RCTech has a whole thread on this tool and how to properly use it. I recommend anyone interested read it. Basically what happens is that a very worn driveshaft pin will have less material at the end, or will have a slight angle to it from heavy use. And when you put the Mugen tool on the worn driveshaft pin, the tool can easily slip off from the lack of material to push on causing the tool to break. The remedy? Take a dremel and cut down the warn driveshaft pin to create a nice, flat, even surface for the tool to push on. And in the future, dont let your driveshaft pins wear down so much, replace them regularly! So the next time you replace those pins, it will be a breeze with no dremel needed. And in case you were wondering were to get new pins? Buy these cheap dogbones (KYOIF144) and steal the pins. Your universals will love you long time. the tool is great. if you're breaking pins you're doing it wrong. if your pin is worn badly cut it off with a dremel. if you're applying a lot of force STOP! it should push out easy. can't blame the tool if you don't understand how to use it. I've replaced dozens of pins and never broke anything. I'm giving this tool 3 stars for a couple of reasons. The quality of the parts is mediocre and the design can be improved with a few simple changes. It does work but needs a pretty hefty hand to get the pins moving. I thought for sure I was going to break something first, but it finally broke the pin loose and worked as advertised. If Mugen simply used higher quality materials, steel for the block and high grade steel bolts with a much smaller thread count, this tool would be absolutely perfect. I've taken all precautions that I was warned about in other reviews to make sure not to break it, but the poor quality steel in the bolts caused one of the threads to fail and get caught up in the middle of the tool, pulling out a few nice bundles of shredded aluminum slivers. I'll be lucky if it lasts more than half a dozen more driveshafts before giving out completely. Come on Mugen! How about some better materials. I'd even pay and extra 50% if the tool was professional quality. I have had the same exrerience as "Lots of RC stuff". This is my first pin tool & I only managed to remove one pin before it broke. I dremeled the old worn pin to a flat surface & used it to push out the second pin with sucess. The other complaint is the ratchet will tend to skip from time to time. This tool has potential but in its current design is complete garbage. I've gone through two of these in less than 6 months as the tool which pushes the replacement 3mm pin into the bone is softer material than the pin causing the tool to break apart. I thought the first one was a fluke so I ordered another one. One the third pin...snap. I'm no newb...been racing for over 10 years and replaced my fair share of pins with the Hudy tool. DO NOT WASTE your money on this item. I've sent both back to Mugen Seiki Racing in CA, we will see how well they stand behind their products. Very unsatisfied and these should be removed from stock. UPDATE - I sent both failed tools back to Mugen Seiki Racing with a nice letter explaining my experience. MSR never responded and upon repeated follow ups never replied to my email. Last ditch effort I phoned their customer service who took my information but never got back to me. Horrible customer service, I will never own or recommend a Mugen product again. There are many other companies in this industry who appreciate my business. DO NOT BUY this product! Don't waist your money on this tool, the first time i used it, it broke as the pin on the removal tool is far to soft and will shatter when you try to use it. Pay a little more and get the hudy tool. Very disappointed i should have known better. Tool works excellent. Don't know how people are breaking the tool but if u follow the instructions u shouldn't have problems. I have changed over 20 pins and still works great. U are suppose to use the bolt without the pin first to break the pin lose in the drive shaft then use the tool with the pin to remove it the rest of the way. Worth every dollar. Worked well for me. I used it on my associated RC8B and T3. I replaced the original pins with the slightly longer Mugen pins. I have been in the hobby for 2yrs now. I purchased the Pin replacement tool about a year ago. I have 2 X7's,6r, 6e, 6t & 7e and have replace all the pins in each vehicle at least once. I'd say 35-40 pins without breakage(as I'm knocking on wood). I have dremeled a couple that I let go to far. I try to us a vice when at home and I carry a large 7/8" wrench with me to hold the chuck at the track. I also use the recessed piece to break the pins loose then swap to the pin part everyone is breaking to smoothly push the pin the rest of the way. It's one more step to the process but seems to work well. I love this tool. I have this tool and I love it!!!!!!!! It is so easy to use. If used properly you will not be disappointed. Awesome tool! It is much easier than the old way! I wore one out and got another one as soon as possible! dont bother using if the pin is 50% or less the pin tool will chip. (Update)= I got the tip to try it again and it chip with more them 50% don't spend your % on it. I just purchased this tool a few weeks ago and it hasn't missed a beat. Im a firm believer of hudy products but im glad I didn't go that route for this. This tool has swapped every pin out of my 8ight-t 1.0 ( you can imagine how jacked up those pins were) 8ight 2.0eu and hasn't givin me a single issue. All pins came out easy and without having to beat on anything lessons the risk of damaging me or my shafts imo. Also the size of it is nice cause I didn't have to pull some of my shafts all the way out to swap the pins so of your in a tight spot at the track itll work perfect. I had been wanting a tool like this for some time and when Mugen made one I knew it would be awesome and it is. If you are having any issues with this tool you may be going a bit too fast. Try slowing down and making sure the pins are aligned before turning it. I highly recommend this tool. I did put some grease on the threads to smooth out the action it seems to help. I love it. got this tool a month ago. have replaced prob 9 pins since then, had the wrench skipping once.